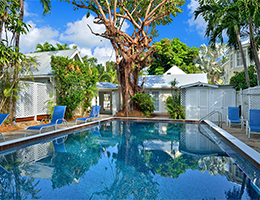 Experience true tropical Key West living as the locals do in this spacious mid-century private garden oasis home with large swimming pool and trickling waterfall. 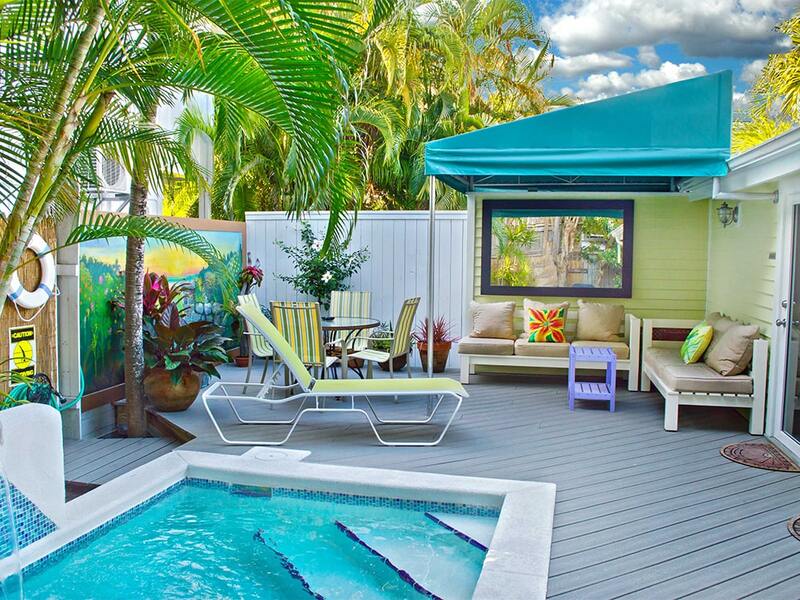 Located just one block from the beach, Private Pool Garden Villa vacation rental is at once exotic and comfortable. 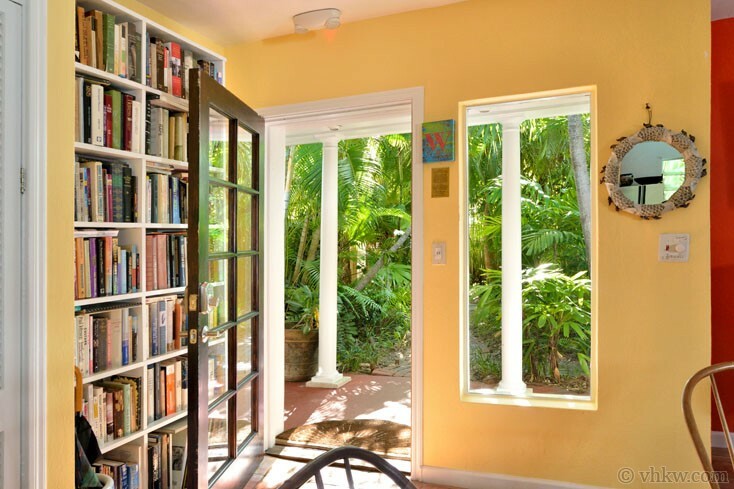 The colorful interior walls with French doors and windows throughout the house become picture frames anchoring the lush tropical garden that surrounds the property. 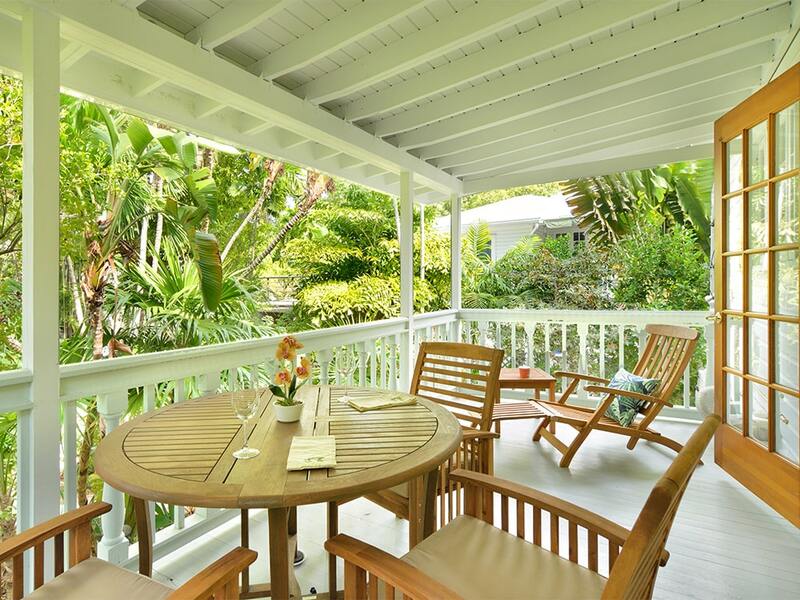 Authentic tropical style is what this corner lot property offers. A variety of lush foliage peaks over the high lattice topped fence. Bright red blooming bougainvillea vines drape the trellis entrance and then a bricked pathway inside the gate winds its way through the garden and leads to the front door. 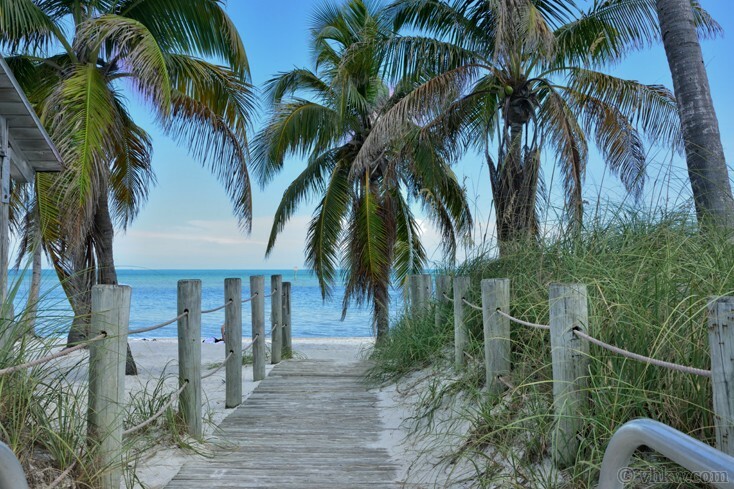 A variety of mature palm trees provide a rich calm feeling. Beautiful landscape lighting creates an enchanted feeling at night. 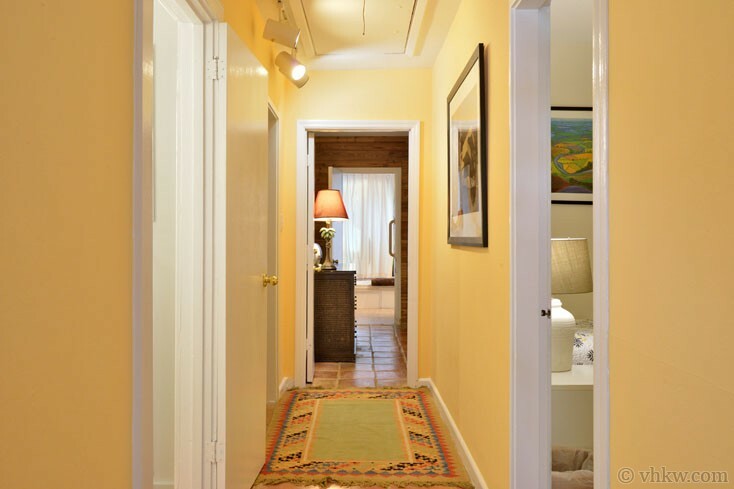 Inside the Private Pool Garden home, the spacious open living room/kitchen floor plan, is made to feel even larger with expansive octagonal ceilings and brightly colored walls. 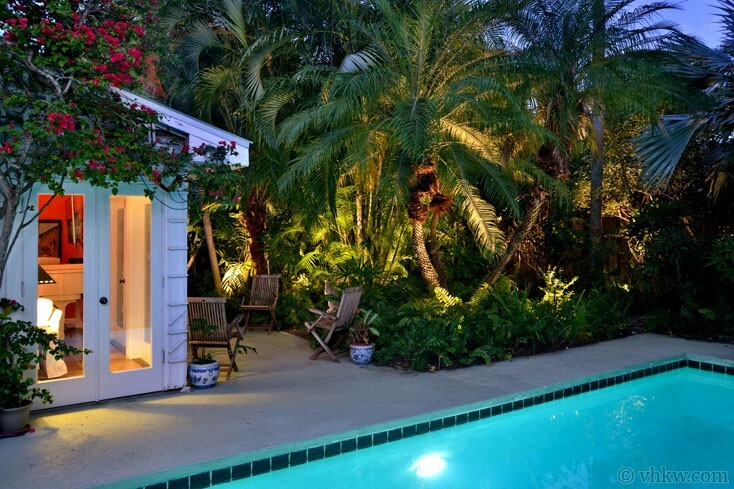 An extensive renovation of this mid-century ranch style house was completed in the 1970's to create the beautiful pool, cabana, lush garden, and spacious open living room kitchen floor plan. Now considered "vintage modern" the authentic 70's design is complete with a white painted brick fire place and Baby Grand piano. French doors open to the focal point of this unique home that is most definitely the large swimming pool, pool cabana room and extensive garden. The floor plan of this home is traditional with all three bedrooms located off the hall that leads from the main living area. This home provides two master bedrooms - one bedroom with a king size bed, one with a queen size bed, both have en-suite bathroom. 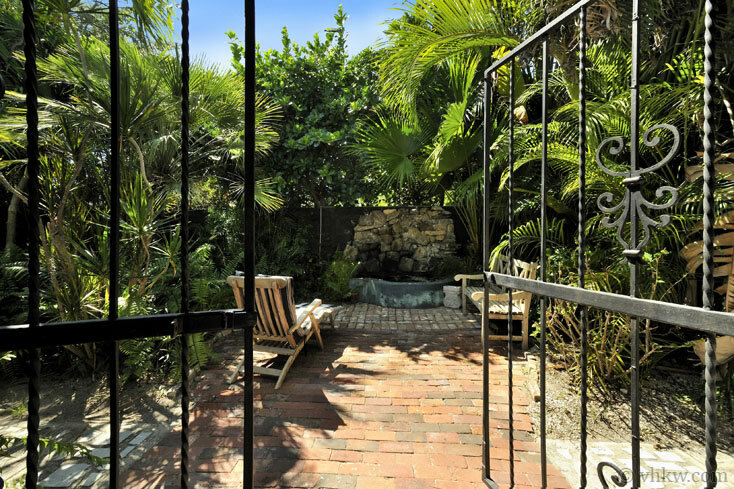 A unique added feature is a bricked courtyard outside the blue master bedroom and little intriguing garden space for relaxation. The third (spare) bedroom, also off the hall, is cozy and has a tropical forest view of garden. Bedding is a trundle bed that offers one or two twins. 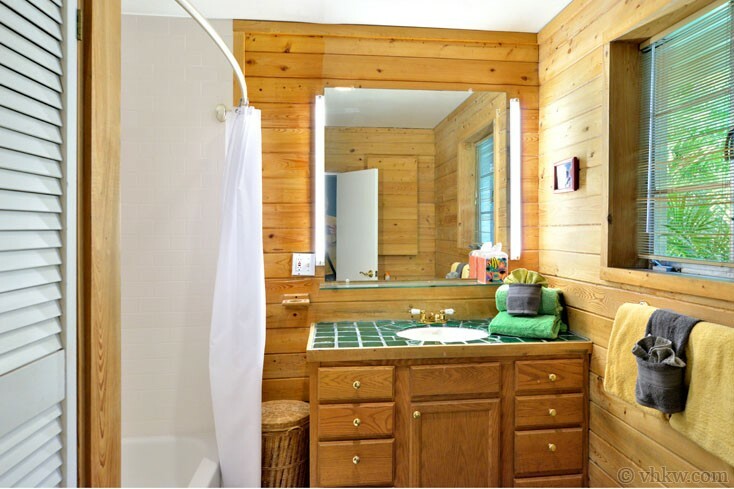 The half bath (i.e. 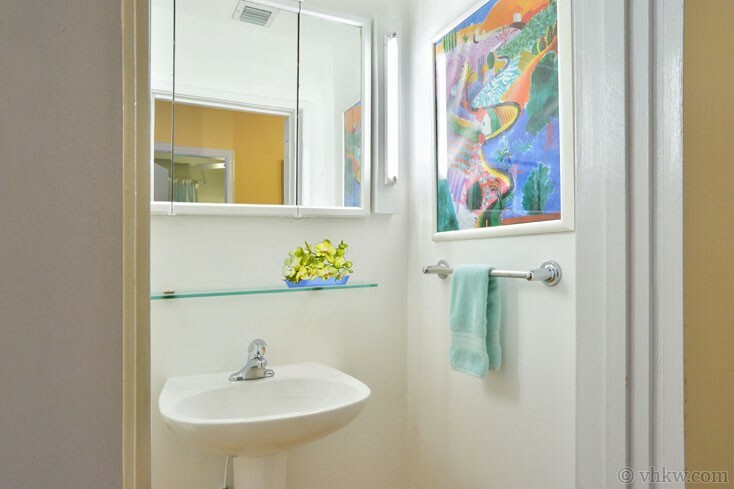 sink and commode) are directly across the hall from the third bedroom. 1 king size bed, 1 Queen size bed, and a trundle bed (2 twins). Special Features: Very large swimming pool and fun outdoor cabana entertaining area; Baby Grand Piano. Close to the beach. Amenities: Large swimming pool (heat optional) with large garden, fenced yard, full kitchen, A/C, W/D, color cable TV, BBQ grill, C/D player and stereo. Linens and towels provided, easy neighborhood parking next to house. Pets allowed, restrictions apply. 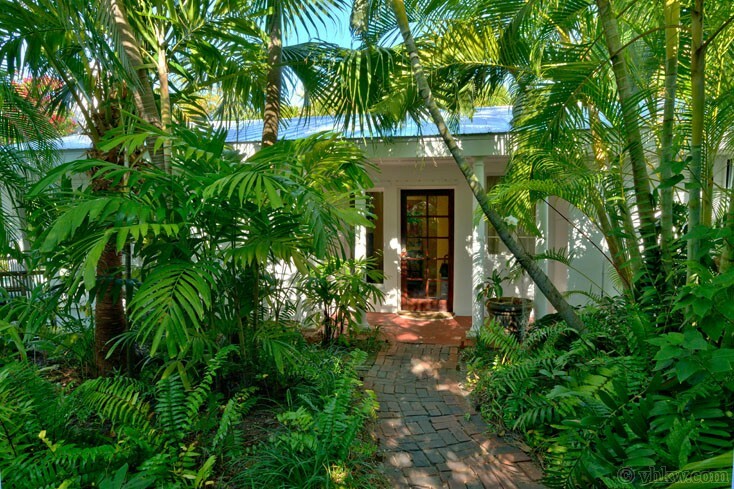 Area: The property is very unique for a Key West weekly rental in that it is located in a quiet residential area away from most vacation rentals that are licensed to rent weekly. Situated on corner lot, there are neighbors only on one side. 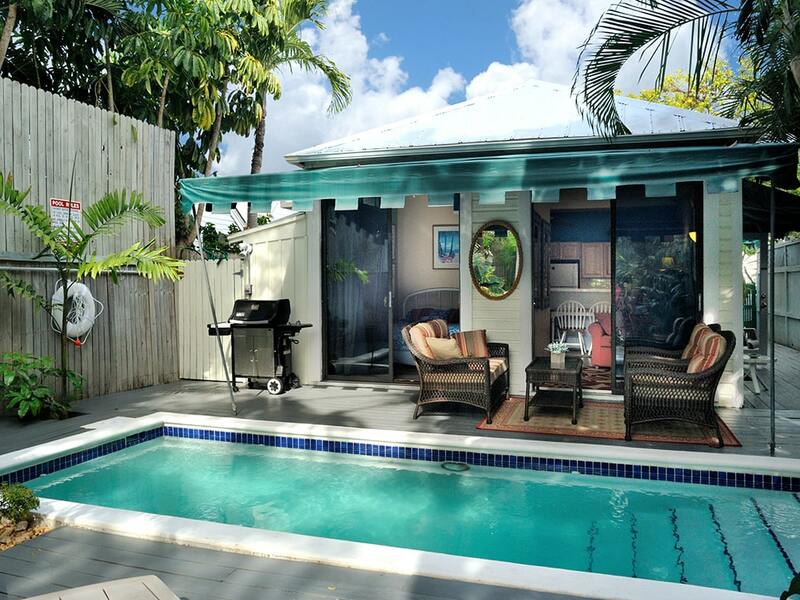 There is plenty of room to lounge at the pool in the large garden area.Located on the south side of the island in the beachside neighborhood, the houses on this street are less than a five minute walk to Higgs Memorial Beach. It's not unusual to see folks walking or biking to the beach in their bathing suits with towel and cooler under arm. 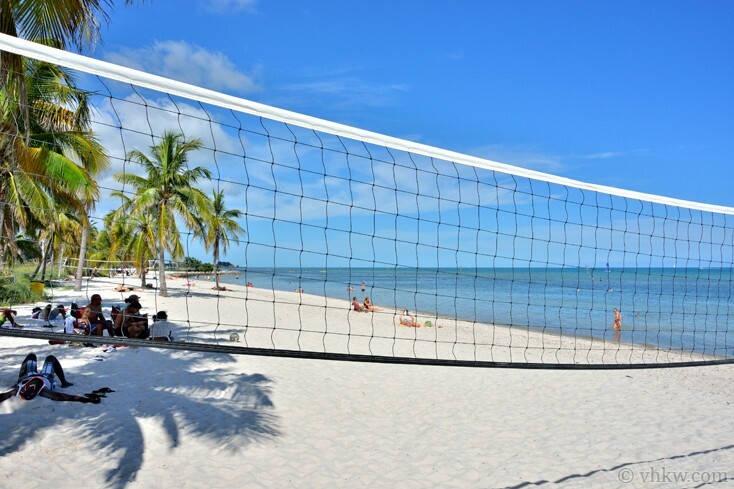 Enjoy the paved biking and walking path stretches along the beaches, beach volleyball, tennis, and bocce ball. 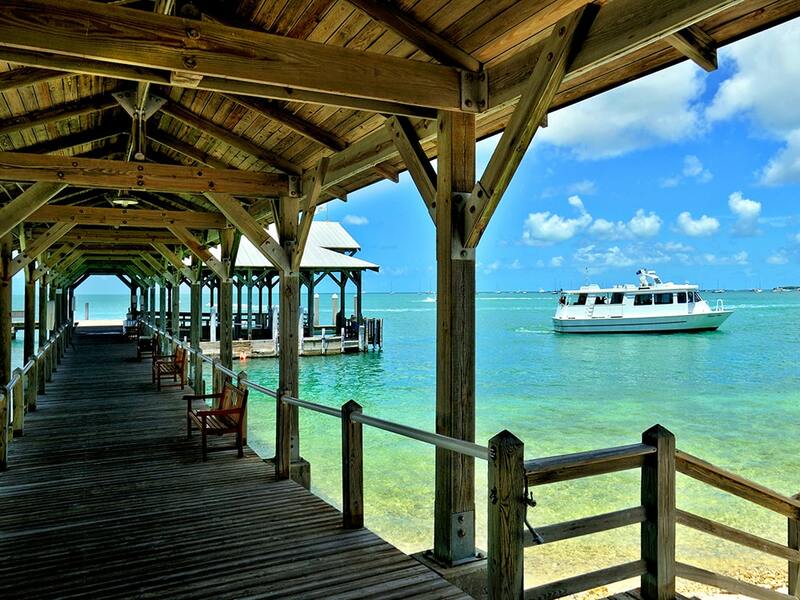 Famous laid back Salute Restaurant on the Beach has great food and a full bar. 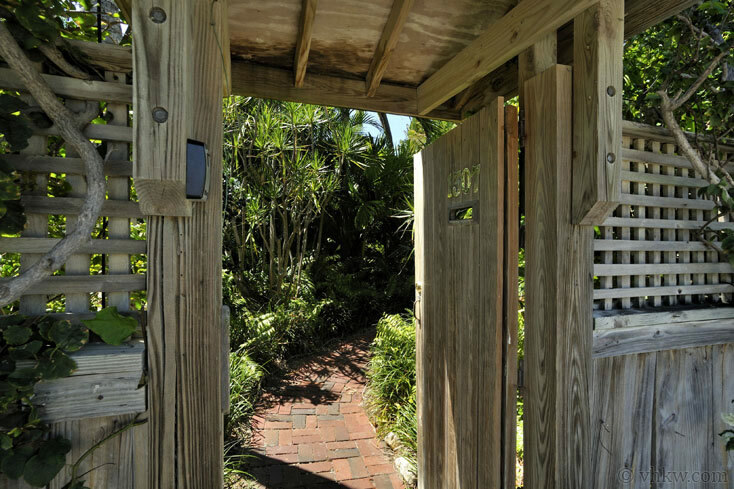 The Civil war fort, West Martello Tower is the home of the Key West Garden Club, a gorgeous place to visit, and a beautiful place to stage a beach wedding. 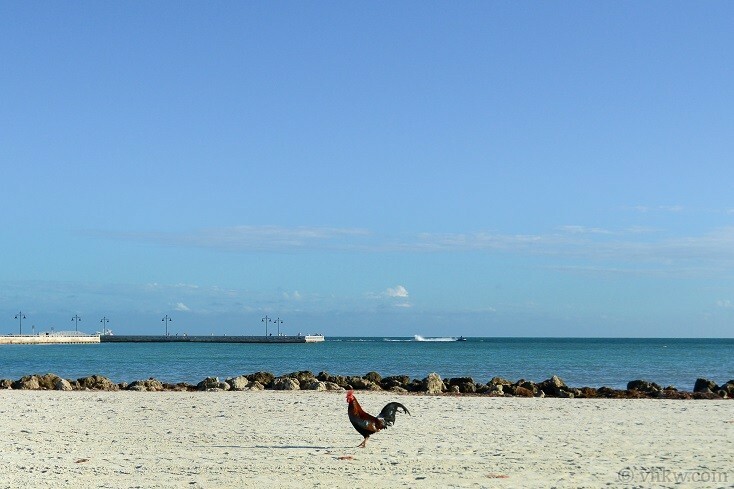 Activities: Beach, shopping, restaurants, museums, sailing, boating, snorkeling, diving, theatre, night life, family activities. Close access to Old Town. Restrictions: The property will not tolerate smoking inside. The property is located in a residential neighborhood and is definitely not suitable for staging loud parties. We do not accept guests less than 25 years of age unless accompanied by a family group or guardian. Pets allowed, restrictions apply. Apr 20, 2019 - May 26, 2019 $3800 $700 4 night min. or 3 night min. 60 days prior to arrival. May 27, 2019 - Jun 14, 2019 $3600 $700 4 night min. or 3 night min. 60 days prior to arrival. Aug 9, 2019 - Oct 19, 2019 $3600 $700 4 night min. or 3 night min. 60 days prior to arrival. Oct 27, 2019 - Nov 3, 2019 $3600 $700 4 night min. or 3 night min. 60 days prior to arrival. Nov 11, 2019 - Nov 22, 2019 $3600 $700 4 night min. or 3 night min. 60 days prior to arrival. Nov 30, 2019 - Dec 20, 2019 $3400 $700 4 night min. or 3 night min. 60 days prior to arrival. Jan 4, 2020 - Jan 10, 2020 $4000 $800 4 night min. or 3 night min. 60 days prior to arrival. Jan 11, 2020 - Jan 17, 2020 $4000 $800 4 night min. or 3 night min. 60 days prior to arrival. Jan 18, 2020 - Jan 24, 2020 $4000 $800 4 night min. or 3 night min. 60 days prior to arrival. Apr 18, 2020 - May 24, 2020 $3800 $700 4 night min. or 3 night min. 60 days prior to arrival. May 25, 2020 - Jun 12, 2020 $3600 $700 4 night min. or 3 night min. 60 days prior to arrival. Aug 8, 2020 - Oct 22, 2020 $3600 $700 4 night min. or 3 night min. 60 days prior to arrival. Nov 1, 2020 - Nov 7, 2020 $3600 $700 4 night min. or 3 night min. 60 days prior to arrival. Nov 16, 2020 - Nov 19, 2020 $3600 $700 4 night min. or 3 night min. 60 days prior to arrival. Nov 29, 2020 - Dec 18, 2020 $3400 $700 4 night min. or 3 night min. 60 days prior to arrival. VHKW are very efficient and responsive and made the rental process very easy. The staff made themselves available and any questions or concerns were handled immediately. 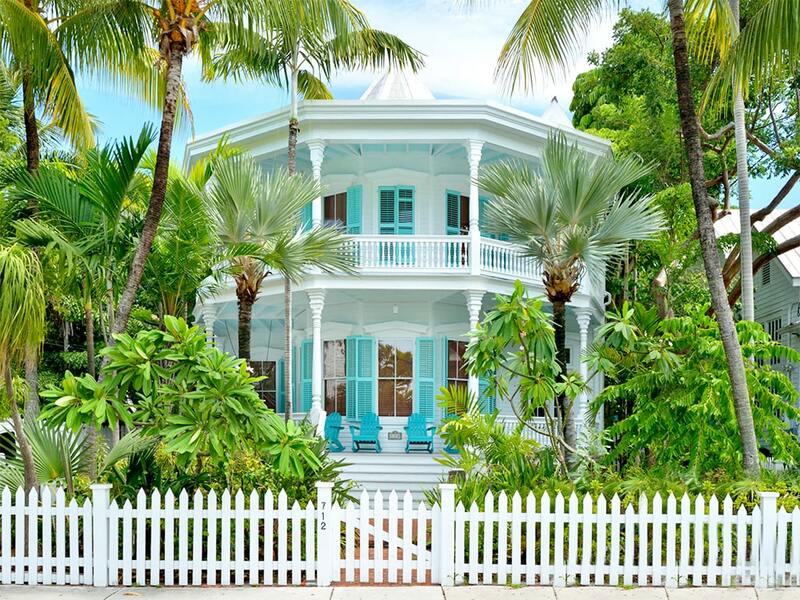 The house was great and we loved our time in key west. 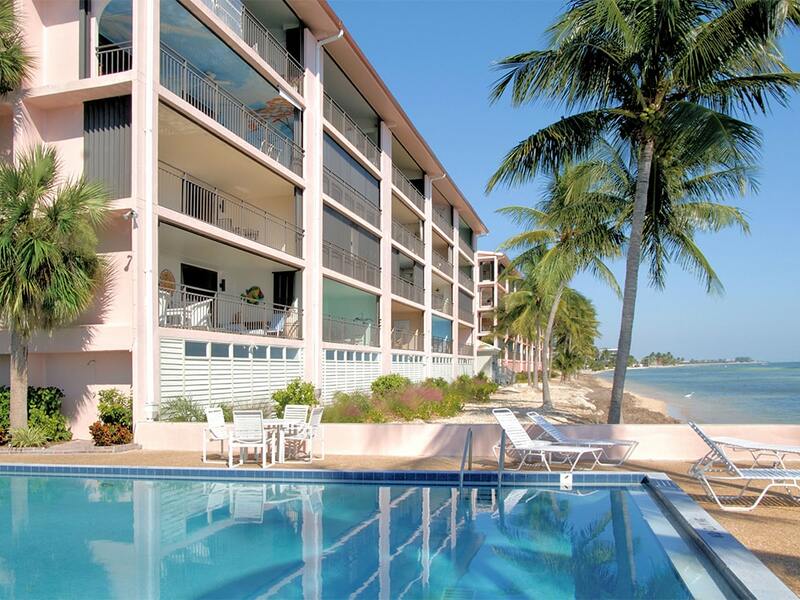 We have used VHKW for other vacation rentals and have always had a superior experience. The home, although needing perhaps a little TLC [likely because of wear and tear of travelers] - was truly beautiful and well equipped for living and although we experienced a number of maintenance issued during our stay - maintenance was quick to respond and generally able to resolve any difficulties quite promptly and courteously. The pool and outdoor living space was impeccable and truly deserving of 5 stars! 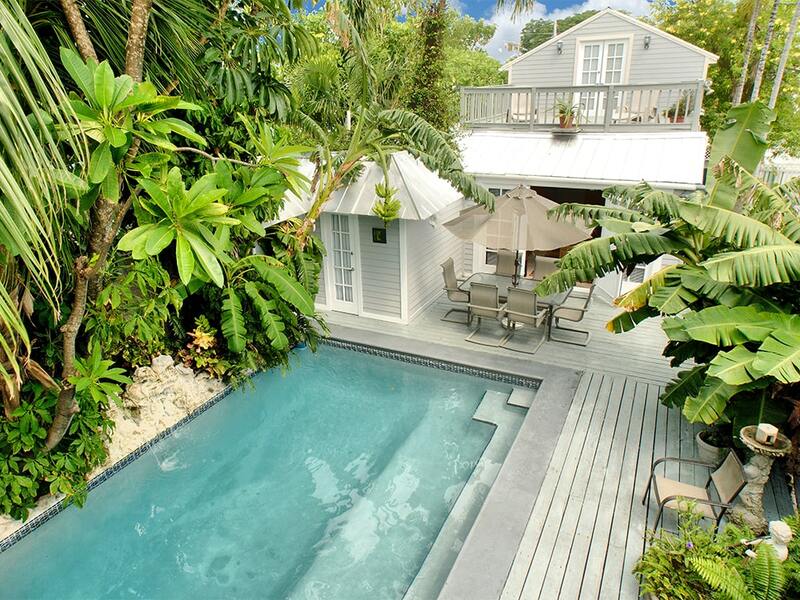 Definitely a lush and tropical paradise. The housekeeping recommended by VHKW was excellent, very affordable, and willing and able to work around our schedule. I would highly recommend them to anyone. All-in-all it was an extremely nice way to visit Key West, FL. Absolutely beautiful hidden gem! The house was charming but the outdoor Oasis was so amazing. We ate all of our meals outdoors, relaxed, swam and repeated daily! The location was a very short walk to Higgs Beach and not much further to Smathers Beach(A feet friendly beach). It was about a mile walk to Duval Street. That being said it is very easy to get around via bikes, scooters or Uber. We are a very active family so we enjoyed walking and living island style. We did everything vacationers would do. Thanks so much! Hope to visit another property in the future. This home was beyond beautiful, cozy and inviting. The pool and portico made the outside it's own haven. We will definitely come back to enjoy this home again. 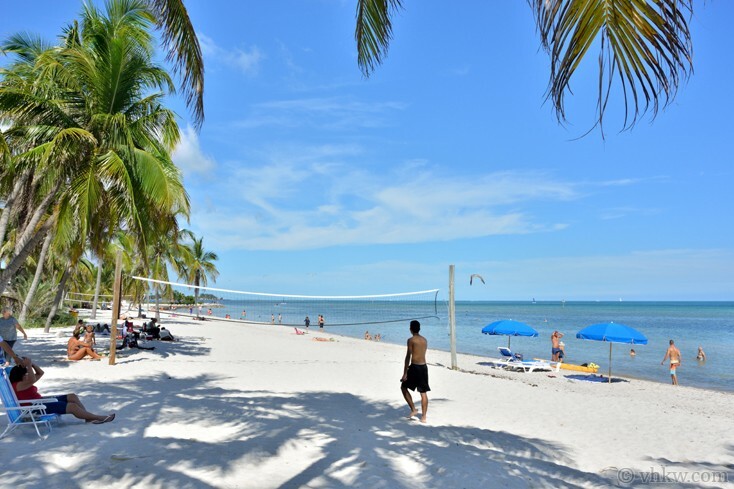 I had an excellent experience with Vacation Homes of Key West! The staff was courteous professional and very very helpful when we called. My family and I loved the property and we will definitely plan on coming back. The house was perfect for our annual trip to KW. 2 we had 2 families of 3. Both couples had a room with a bathroom and the girls shared the office bedroom. The pool area made the house. It was perfect to come home to after a day at the beach.